I have some big news, but I’m going to make you hunt for it. So, check out my Home page and see if you can discover what’s changed. It’s some good news. It’s not the fantastic news I wanted to tell you, that’s going to have to wait until next week. But this is darn good news. If you can spot the difference, send an email to cc@cchunterbooks.com and I will give away Shadow Falls posters to five people who email me the correct answer. Last week I gave you some teasers for Chosen at Nightfall. Everyone had a lot to say about what I posted. But all of those teasers were about Kylie, but what about her friends? Aren’t you curious about what Della is up to? How about what happens with Miranda? Well, I thought I’d tell you a bit about what to expect from them. …accuses Kylie of betraying her. …has someone pay in blood to spend an hour with her. …tells Kylie what really happened during her and Steve’s mission for the FRU. …finally carries through with her threat to give someone the worst case of pimples they’ve ever seen. …has a big argument with Perry. I hope that gives you a few things to think about. Now, don’t forget to look for the change on my Home page, then email me. You could win a Shadow Falls poster! Wow! I was stunned by all your answers on last week’s blog. I have to tell you, a lot of you are going to get your wishes and some of you predicted what’s going to happen in Chosen at Nightfall—well, almost anyway. And no, I won’t tell you which of the ninety comments are closest to what will actually happen. But I suppose it’s time for me to start giving you a few clues. Oh, and I have some other news that I’m dying to tell you, but I can’t… I know it’s mean to tease you, but seriously, this is some great news and I know you guys are going to be thrilled. (And no, it’s not about the TV series or movie. I’m still waiting and could be waiting for months to hear about that.) Anyway, I hope to be able to share my good news with you on next week’s blog. And I’ll also be giving you a few more clues about what’s going to happen to Kylie in her last book. So make sure you guys come back to read the blogs. 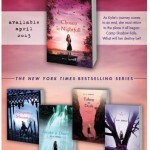 And if you haven’t preordered Chosen at Nightfall, do so now. Here’s hoping these clues will get you all excited and dying to get your hands on my next book. Also, the video for Chosen at Nightfall is just about done and it’s so cool! I’ll be posting that soon, too. In Chosen at Nightfall Kylie. . .
…is accused of having an affair with an older man. …tells a human that she’s a supernatural. …gets read the riot act by Burnett. …has an unwanted guest crawl over a bathroom stall when she’s trying to pee. And in other news, if you live in the Houston area, I will be having a couple of signing soon. As soon as I have the details, I’ll be posting the dates, times and places on my events page and my Facebook pages (CC Hunter Books and Shadow Falls Series), so make sure you keep checking. The four winners of the Shadow Falls posters from last week’s giveaway are Monica Coburn, Bratty Grrl, Cathy Phung and Rachel Isdale. Congratulations! You have until February 5, 2013 email me at cc@cchunterbooks.com with your mailing address. February 2, 2013 is the Montgomery County Book Festival. It is a fantastic one day event where there will be over 40 authors speaking and signing their books—and I will be one of those authors! There will even be a Teen Zone where you can mingle with the authors, make crafts and pick up prizes and giveaways. And it is all FREE! It will be held at the Lone Star College—Montgomery Campus, 3200 College Park Drive, Conroe, Texas from 9am to 5pm. This is a huge event with an opportunity for you to meet me and many other wonderful authors. So, anyone in the Houston, Texas area should come by for a fun time filled with great giveaways! Now, I thought we’d have a little fun this week. This is your chance to let me in on what you are thinking about Kylie and her friends. So, I’m going to give you some sentences and you can fill in the blanks. I wish Kylie would_______ before she________. Lucas would be the perfect hero if only he would________. Derek would win Kylie over if he would just_________. I would love to see Della face______. If you leave a comment, you will have a chance to win one of four Shadow Falls posters I’m giving away. So, have some fun with it, and let me know what you are thinking. What better way to start off 2013 than with some exciting news? There have been a few rumors, but now I can confirm it, Born at Midnight and Awake at Dawn (books 1 & 2) are going to be released as one book. Titled Shadow Falls: The Beginning, it will be released March 5, 2013. 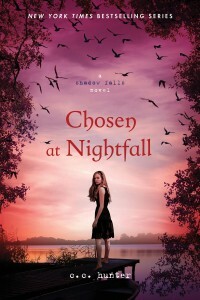 And with the release of Chosen at Nightfall on April 30, 2013, I know spring is going to be a very exciting and busy time for me. I can’t wait! So, if you haven’t read my Shadow Falls series or if you have a friend who hasn’t read my books, this is a great way to buy the first and second book for one low price! So make sure to spread the word with your friends who want to read my series, because this is a great deal. Shadow Falls: The Beginning can be preordered now on the Macmillan website, Amazon, and Barnes and Noble. So, what are you waiting for? Can’t Get Turned at Dark? I receive many emails from readers who live outside the USA. Consequently, they cannot download Della’s story, Turned at Dark, from Amazon or Barnes and Noble. But there is another way. You can now read Taken at Dark on my website under the “Special Content” tab. Or, if you wish to download the book, you again go to the Macmillan website and scroll down to the “Book Excerpts” section, then you can click on the link on the right called “Read a short story by Hunter.” Turned at Dark should come up on your computer and you can download it from there. So now everyone can find out how Della became a vampire and how she came to be at Shadow Falls Camp. I did a little research and discovered that it is said that the Babylonians were the first to make New Year’s resolutions, and people all over the world have been making and breaking them ever since. The early Christians believed the first day of the new year should be spent reflecting on past mistakes and resolving to improve oneself in the new year. Are you one of those people, like the Babylonians, who sets New Year’s resolutions? I know a lot of people who tell me, “I don’t do that. Why set myself up to fail?” I know, I know. We make them every January 1st and most years we let them fall by the wayside. Then, we sort of blame the whole resolution custom because it just doesn’t work out. I know this because I’ve been there. Done that. Worn the T-shirt. Worn that T-shirt out. But here’s my question. Is it the custom’s fault? Or is it us? Anyway, this line of thought got me thinking about the whole goal setting process. And yes, I do see New Year’s resolutions as goals. And I’m a big goal-setting fanatic. Seriously, I didn’t finish a book, sell a book, and hit some major publishing list without setting and achieving goals. And the process of goal setting isn’t algebra. It’s rather simple. We want something so we map out a plan of requirements/steps/tasks that we must do to accomplish said goal. Simple, right? So why the heck are my resolutions this year almost identical to the ones I made last year? Can you guess which ones they are? Oh, heck, I’ll just say it. For some reason any goals that involve controlling what yummy stuff goes into my mouth or what yucky stuff I do called exercise are harder to achieve. Not that I’ve been totally bad about the exercise. I’ve managed to keep a good walking routine. At least four days a week I walk for about an hour. But guess what I learned. I have other muscles in this body other than those I use to walk. So here I am again this New Year, thinking about what I need to do to get in better shape. And I’m setting a new list of resolutions. And why am I doing this again when, realistically, I’ve already proven I might fail? Well, I gave it some thought and concluded, I’m not a realist. I’m an optimist. Besides, for me to say I don’t believe in resolutions is like saying that I don’t believe that I can accomplish something. That I’m going to stop pushing myself to be better. And I’m a pusher by nature. I ended up joining the YMCA. But this got me thinking about how I was able to accomplish part of my walking goals last year. The main reason I’d not failed was because I’d had a partner. Susan, my neighbor, friend, and writing buddy joins me on those treks through our neighborhood. And my other neighbor is a member of the YMCA, and we’re going together two times a week. So, hopefully, I’ll stick to this resolution and work out those muscles I forgot I had. Now for my other goals. 1. Controlling yummy stuff—I’m thinking of trying to talk a friend into going to weight watchers with me. 2. Try to stay on top of book deadlines—focus on getting more pages done daily. 3. Balance work with play—make more plans to do short vacation trips. Use the trips as a dangling carrot, i.e. if you get two chapters done this week, you can go New Orleans for the weekend. 4. Read more and watch less television. We’ll see how I do this year. Okay…so there you have it—my resolutions. Anyone want to share their resolutions and how you plan to meet them? May I suggest getting a partner to help you accomplish those goals? It really does help. Wow, it sounds like y’all had a great Christmas. So many of you posted on my last blog, it made it hard to pick the winners. But the winners of Shadow Falls posters are Hillary Reyne, Katy Austin, Aspen and Hannah Rose. Please email your mailing address to cc@cchunterbooks.com ASAP! Congratulations!